Dental disease can make eating, play, and other day-to-day activities painful for pets. Even though we don’t think about it that much, there is one telltale sign to watch for: bad breath. We love their kisses, but we don’t always love their breath. Bad breath is caused by bacteria. While some bacteria is normal – both for us and for our pets – when it forms a film of plaque on the teeth, breath gets gross. A lot of plaque is removed during normal daily activity, such as eating crunchy food, chewing toys, and even the normal tongue movement throughout the day. But when plaque stays on the teeth, it starts to thicken and harden into tartar – which makes breath even worse. Tartar is a brownish buildup that you can see on the teeth – but by the time you see it on front teeth, it’s likely that it is thick on back teeth, and below the gum line, where it causes inflammation called gingivitis. If left untreated, gingivitis progresses into periodontal disease. The good news is, there is plenty you can do to keep your pets’ mouths clean and healthy. Start with a dental health checkup. Your veterinarian may recommend a full dental cleaning. This is much like we would get at the dentist, but the pet has to be anesthetized because even the best-trained pet won’t tolerate the scraping and polishing that needs to be done. A diet that has the Veterinary Oral Health Council (VOHC) seal of approval. Safe dental chew toys that are designed to help remove plaque. Brushing your pet’s teeth several times a week with a toothpaste designed for them – remember, human toothpaste is toxic to pets! A water additive that works like human mouthwash, only designed to be safe for pets to swallow. 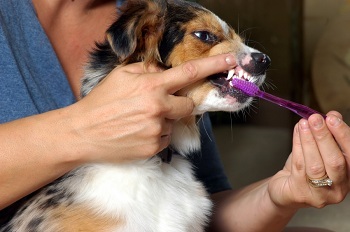 Make dental health part of your pet’s preventative healthcare. Regular wellness checkups include checking your pet’s mouth for signs of dental problems, so don’t put it off! They give us so many reasons to smile, so this February, let’s think about making them smile.